Home For Patients Deep Brain Stimulation Information What is DBS? Deep Brain Stimulation (DBS) is a relatively new procedure that utilizes a lead that is implanted into “deep” brain structures. It may be used in place of or in conjunction with lesioning procedures such as pallidotomy or thalamotomy(8) (burning a hole in structures in the brain that control movement). Patients with PD, tremor, dystonia, or OCD/Tourette who are medically refractory to standard therapies, and who have no cognitive difficulties or “minimal” cognitive dysfunction, and who are otherwise healthy may qualify. The currently used lead is FDA approved and manufactured by the Medtronic corporation. It has four electrode contacts (quadrapolar), and depending on the disorder and/or the target, one may use variable sized contacts with different spacing arrangements (Photo A). Each contact can be activated utilizing monopolar or bipolar stimulation, and multiple settings can be adjusted for individual patient needs. These settings include the pulse width (how long the stimulation is), frequency (how often the stimulation is delivered), and amplitude (how much stimulation) of stimulation. 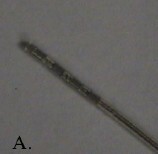 The DBS lead is placed into a brain target, and is attached to a connector wire and a programmable pulse generator (Photo C). The pulse generator or neurostimulator is placed below the clavicle. The pulse generator is connected to the DBS lead by an attachment wire that travels across the posterior aspect of the neck and skull (Photo B). Question #2 Who is a Candidate for DBS?